The eldest of ten children, Alfred Newman was a musical prodigy, starting piano lessons at the age of five, and studying composition with Rubin Goldmark, who also taught Aaron Copland and George Gershwin. By 1920 he was working as a Broadway conductor, and, in 1930, he accompanied Irving Berlin to Hollywood. There he took private lessons from Arnold Schoenberg and wrote his first film score for Goldwyn’s adaptation of Elmer Rice’s 1929 Pulitzer Prize winning play Street Scene in 1931. Seventeen years later Kurt Weill made an opera from the same play. Writing in a late romantic idiom, but with a more American voice than either Max Steiner or Erich Wolfgang Korngold, Newman has never received the wider attention of so many of his contemporaries. Writing in 1996, Fred Steiner lamented, “Some of the films (he) scored then don’t have drawing power today. Wuthering Heights (1939) may be OK, but whoever heard of Beloved Enemy (1936)? It’s not like the popularity of The Adventures of Robin Hood (Korngold) or Gone With the Wind (Steiner).” Between 1930 and 1970 Newman wrote music for over two hundred films and acted as musical director for many more. He won nine Oscars and, between 1938 and 1957; he was nominated in twenty consecutive years. P C Wren’s Beau Geste is a desert drama concering three brothers (played by Gary Cooper, Robert Preston and Ray Milland) and their undying devotion to each other and family. Newman’s score is rumbustious, humourous and tender by turns. The Prelude has a swagger before turning to orientalism, and after some delicate work the March Out is a defiant cue for the Foreign Legion. After the brilliantly scored Battle, with the addition of a female chorus, death spreads through the doomed Fort Zinderneuf in A Viking’s Funeral – the most heart-felt music in the Suite. The Finale is reserved before giving way to a quick reprise of the March for the End Cast. In his biography of Charles Laughton (Charles Laughton: An Intimate Biography, Doubleday New York, 1976 and W H Allen, London, 1976), Charles Higham wrote that The Hunchback of Notre Dame was “… an operetta without songs, accompanied by … Newman’s crashing chords and celestial choirs, suggesting menace or exaltation.“ Fred Steiner said, “It’s a truly remarkable score, especially in regard to the character of the themes. The great thing about the themes for the hunchback, Esmeralda, the young soldier she falls for and the poet Gringoire is that they all fit their personalities so well … it’s real music.” This is a big, colourful, score; motifs come and go and are developed throughout the film. There’s more orientalism in Esmeralda’s Dance, and, very surprisingly, in Thank You Mother of God, there’s a solo for flute which is uncannily like the flute solo in the final movement of Gustav Holst’s Beni Mora! Celestial choirs, strange, Bernard Herrmann-like timbres from the low woodwinds, delicate string writing and almost Parry-like choral odes abound in this score. Please note that I make these comments not because the music sounds like Holst, Herrmann or Parry but to give some idea of the wide range of the music. All About Eve doesn’t have a big score and this little suite is tantalizing: a jaunty opening titles sequence, followed by various incarnations of Eve’s theme from tender and innocent to its climactic appearance reflecting envy, lust and the intoxicating allure of the theatre limelight. The musical performances are assured and if the Moscow Symphony Orchestra doesn’t quite have the verve of the RKO Studio Orchestra they play the music for all it is worth; textures are clear and the various sections acquit themselves well. William Stromberg directs strong, forthright performances with great attention to every detail of the scores. One thing the notes don’t tell us is exactly what restoration and reconstruction work John Morgan and William Stromberg had to do for these scores. This is odd as the booklet for the original release (Marco Polo 8.223750 – 1997) contains a note by John Morgan, and it is most interesting. He tells us that the All About Eve Suite uses the original orchestrations by Eddie Powell. 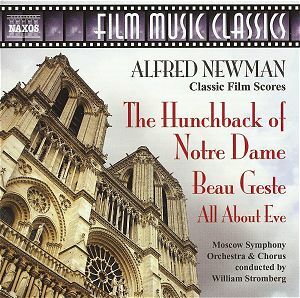 Stromberg created the Beau Geste suite from “Scantily annotated conductor books” and Morgan himself consulted “… the surviving scores and the piano/conductor short scores …” to prepare The Hunchback of Notre Dame Suite, and orchestrated about half of the music to “… bring it more in line with what is heard on the film soundtrack … I was also able to restore many bars and one entire cue dropped from the finished film.” Also missing from the Naxos booklet are almost all the photographs and Bill Whitaker’s excellent notes have been slightly truncated. The original issue also had a better sleeve illustration. Incidentally, Newman was born in 1900 not 1901 as stated on the rear of the CD and in the booklet. Ultimately, it is the music that matters and this is an excellent re-issue of music by a much underrated composer. The sound is excellent and seems to be slightly brighter than the original. A must for all fans of film music in general and this composer in particular.